Kicked back in the chair of a Whistler coffee shop with its trademarked mermaid logo, she and I look on across the parking lot at the 2005 Suzuki Boulevard C90T. The bike handily filling a majority of the parking stall, it stands out glaringly, and even now men stop to point and watch – you come to grow used to this. 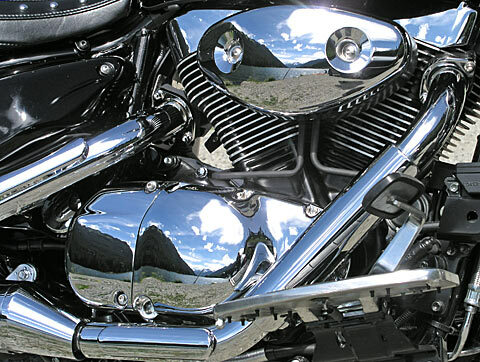 It’s not because of some massive defect, but because it is wrapped in lashings of chrome so extensive and sumptuous that entire developing nations have been depleted of their supply and the stock in moto-detailing companies has skyrocketed in anticipation. Gleaming there, in retro-inspired style, I think the Boulevard looks its best. The mermaid’s silence implies her agreement; this is the near perfect coffee shop cruiser. The C90T is a cruiser and as such there are a different set of aspirations and passions it answers to. In many ways it is as specialized as any track-bred sportbike, the MotoGP inspired offspring of acceleration and lean angle. 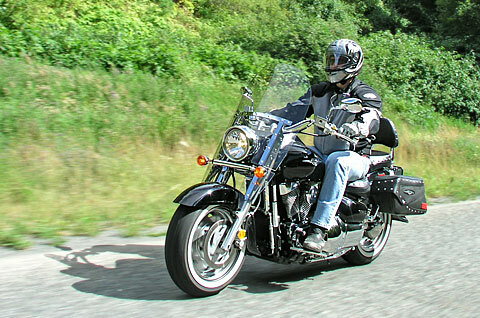 The Suzuki Boulevard C90T, there is no doubt, is about being seen and seeing the world. Even at a standstill it invokes a backdrop of rolling Midwestern prairie with wild horses stampeding parallel to double lane highway, while Bruce Springsteen sings timeless American anthems. Before the C90T casts its headlight in the open road’s direction, it is off to a promising start with sweeping classic cruiser style and sheer presence. The bike is imposing, vast even. Can you use the word vast to describe a bike? In the Boulevard C90T’s case the answer is “yes”. Actually, that descriptor just accommodates the seat, looking at it you’d think that when the marketing suits and ties said the C90T (the T stands for touring) was intended for two-up riding, you’d think they meant side-by-side. If Montana were a design aesthetic then the Boulevard C90T is its realization and the result is commodious. The bars are big and wide – think longhorn. The 15L tank is low and wide, splaying your legs apart with the finesse of gynecological stirrups. To accommodate all these dimensions the wheelbase is stretched to a daunting 1.7 meters aiding in providing an exceptionally stable ride. Smaller bikes could get caught in this beast’s aerodynamic bow-wave – except they would have to be very slow small bikes, scooters perhaps. As with most big displacement cruisers, the C90T’s massive 90 cubic inch/1462cc fuel injected 45-degree V-Twin holds the unrealized promise of tremendous torque and power. The two massive pig-iron lumps seem to have been used as pistons, and appear to be laboriously heaved up and down by some very disheartened gasoline. The C90T has, even by cruiser standards, a plutonic relationship with acceleration at best. If the Boulevard C90T is trying to live up to some American-iron, big bad wolf image, then it has a bad case of asthma. All huff and puff with no blow the house down. Twisting the throttle results in smooth injection response, a world of vibe, and an engine note that will make the gentry’s heads swivel. The key here is that people look, and the cruiser’s purpose has never been acceleration that leaves your internal organs pooled at the base at your spine, but to draw and hold attention in a suspense free process and with a top speed unflustered by ocular considerations such as speed blur. As with acceleration the C90T does not deviate from the cruiser formula in it’s handling. At 296kg/659lbs claimed dry weight the Chrome Giant is heavy enough that you can watch the Earth slowly giving way beneath it, to imbue nimble and light handling would require a special brand of engineering magic. There are no surprises here, no shockingly good handling, nor anything surprisingly bad. At low speeds the bars easily come to a lock and the C90T, despite being low-slung, feels like it’s about to topple. Once the pace picks up, the C90T lives up to the name of the Boulevard sub-brand; this bike is for long slow turns or better yet, unchallenging straights. The C90T is engineered for a land where corners are a novelty, and for a short time so is attempting them. You can get the feel for the twisties with the big Boulevard, but the bike stages protest, hitting its floorboards repeatedly like a tantrum-throwing child, as it rumbles and flows through the turns. Limited by such clearance, one finds 30km marked corners truly mean 30kph, attempts to exceed that pace are simply quixotic. There is, however, a sense of monumental accomplishment when you do hustle the Chrome Giant through the corners; the iron taste of adrenaline under your tongue reinforcing that you’ve likely damaged the local geology with those massive grind-able footrests. It doesn’t take much, even around town traffic speeds elicit the occasional distinctive metal in asphalt scraping sound. The geologic begins to develop as a theme, the Grand Canyon it seems lies between first and second gear of the five-speed gearbox and shifting is the mechanical version of a tectonic event. The feel is of huge metal plates mashing against each other in the Chrome Giant’s innards, resulting in a sense of moment to the shift and an occasional false neutral. Gearing-wise you’ve two choices it seems; lots of vibe with little go, or little vibe with little go. After a time in the saddle, when the uniqueness of the thunder wears off, you’ll likely choose the latter’s luxury. A plush ride is also rendered by the suspension, which soaks up richter-6 roads with calm and aplomb. Up front are non-adjustable forks, twin 41mm pillars, doing their seismic dampening duty, in the back twin shocks adjustable for preload. allowing you to setup for a pillion and well-stuffed stock panniers. Those panniers do not approach the rest of the C90T’s scale. Top loading, they prove poorly thought out, at least in the context of touring. Cumbersome to latch, failing to be water resistant in any vague sense, and unable to hold more than a weekend’s clothes and necessities, the be-tasseled leather bags’ utility are question. There is more of fashion than motorcycle accessory here. Indeed, throughout the C90T there is no evidence that a rigorous sense of design has stood in the way of impulsive part’s bin accessorizing or afterthought engineering. The windscreen may be adjustable, but in its lowest position it impacts against the gorgeous chrome headlamp, and the mounting structure won’t let it reach its highest most back-swept point, with the bolts getting in the way. Regardless of adjustment the buffet persisted when ridden with an open-face helmet, and while exposure to the elements is novel for a time, after 200km the constant head-nod wears thin. Then there is the toolkit, needed to adjust the windscreen, which is hidden beneath a chrome shield, on the downside of the C90T when at rest on the side stand. In order to access the toolkit you need either to lie on the roadside nearly beneath the bike, or be a talented member of Cirque du Soleil… likely from the risqué Vegas Zumanity troupe. This provoked comment from passers-by of whether we needed help “fixing” our bike. In the fit and finish department the Boulevard seems a bit down-scale with the tank mounted gauge cluster not coming flush to the tank and already rusting bolts holding the passenger backrest in place. However, if you were to look at the C90T as a pure ratio of dollars to chrome and leather repletion, suddenly the Chrome Giant stomps ahead of the competition. 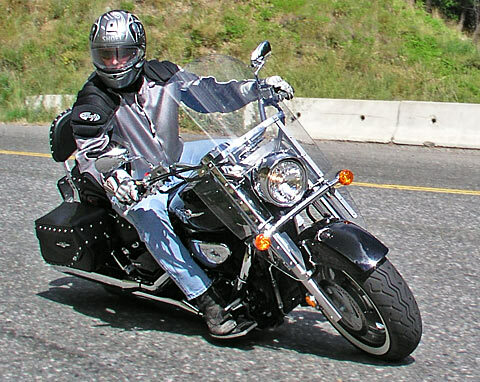 The price difference between the Suzuki Boulevard C90T, at $16,499 CDN and a base Harley Davidson FLHR/FLHRI Road King at $21,889.00 CDN is astronomical. And if you were to pursue a similarly equipped bike from the orange and black mark, the argument for the penny-wise C90T becomes an easy one. While offerings such as the BMW R1200C Montauk with its exceptional handling, the Shadow Aero sporting quality Honda fit and finish, or the astounding bang-for-buck Hyosung Aquila with its handling and power to weight ratio, all add something to the cruiser genre, the C90T seems a gentle reinterpretation content with the species as-is. Where the Suzuki Boulevard C90T excels is value for the look and quantity of stock accessories. As the saying goes “beauty is in the eye of the beholder”, if this is so when you cast a gaze expecting beauty on the C90T it will meet your eyes head on unflinchingly. A bike such as this is grand spectacle on a near scenic scale, and while Suzuki has built the Boulevard C90T for the gentle flow and unchallenging turns of the North American Highways, leaving the sampling of more serpentine and demanding fare to other offerings, there is always a niche for such monumental looks.